The first piece of steel was cut at Meyer Werft in Papenburg, Germany today for the construction of Norwegian Escape, the first of two new Breakaway Plus Class ships for Norwegian Cruise Line, set for delivery in fall of 2015. 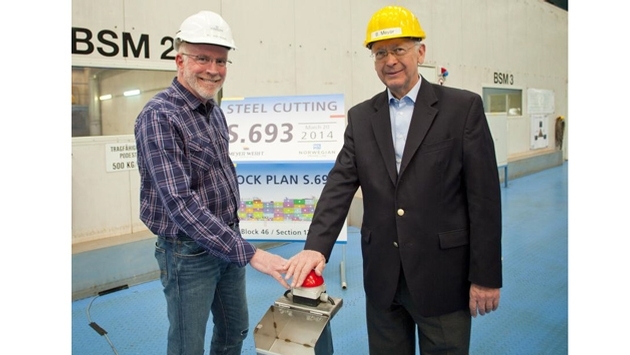 Norwegian Cruise Line and Meyer Werft executives watched as the first plate of steel was cut by a plasma torch in the yard’s state-of-the-art facility. This plate will become part of Block 46 that will comprise the new vessel. “Norwegian Escape will be tenth ship that Meyer Werft has built for Norwegian Cruise Line within the last 15 years and this one is very special, because of the dimensions of approximately 163,000 gross tons and the many new innovations onboard,” said Bernard Meyer, managing partner of Meyer Werft. At Cruise Shipping Miami earlier this month, Norwegian announced that Norwegian Escape will homeport year-round in Miami following her delivery in late 2015. She will sail a seven-day Eastern Caribbean itinerary starting November 14, 2015 visiting Tortola, British Virgin Islands; St. Thomas, U.S. Virgin Islands; and Nassau, Bahamas. Norwegian also announced that famed marine wildlife artist and champion of ocean conservation Guy Harvey has designed the ship’s signature hull artwork which features an underwater scene of marine wildlife. Norwegian’s two Breakaway Plus class ships, Norwegian Escape and Norwegian Bliss, will be approximately 163,000 gross tons and offer 4,200 passenger berths. The ships were named by Norwegian’s Facebook fans around the globe. Norwegian Escape will boast all of the exciting and innovative features found on Norwegian Breakaway and Norwegian Getaway, plus a number of new spaces and interactive experiences that are yet to be announced. Norwegian Escape’s itineraries are open for Travel Partners to book groups, and will go on sale for Latitudes Rewards Members on March 25 and to the general public on March 26. To book a cruise, contact a travel professional, call Norwegian at 888-NCL-CRUISE (625-2784), or visit www.ncl.com.